Twitter has emerged as a social media juggernaut because it allows celebrities to interact directly with one another and fans for the entire blue-birded universe to see. However, Twitter also includes a Direct Message feature that lets people who follow each other to chat privately. Unfortunately for Chael Sonnen, he issued a DM to the wrong dude because Michael Bisping (Pictured) put him on blast for his perceived cowardly ways. “The thing is, to be honest, direct messages on Twitter, it’s personal, it’s private and I think it would be inappropriate to divulge that information,” Bisping said on this week’s edition of UFC Tonight. “But, when have you known me to do the proper thing? 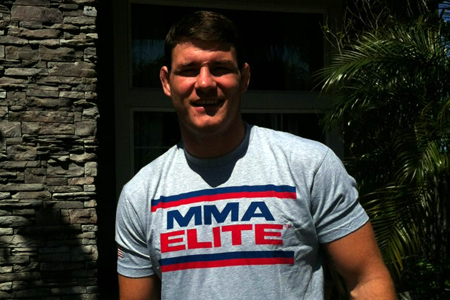 Bisping was forced to pull out of his UFC 149 bout against Tim Boetsch after injuring his knee. The rumor mill had suggested “The Count” wasn’t really wounded and that he was going to replace injured middleweight king Anderson Silva and fight Sonnen at UFC 148. The only problem is, Silva isn’t hurt and Bisping is. That’s when the Brit pieced everything together and concluded Sonnen isn’t too eager to participate in a sequel with him. “Meanwhile, I was sitting in the doctor’s office thinking, obviously, he’s quaking in his boots at the thought of a rematch because he knows I won the last fight and he doesn’t want to fight me again. Sonnen took a fairly controversial unanimous decision win over Bisping at “UFC on FOX 2” this past January. Bisping is scheduled to go under the knife today to repair a torn meniscus in his knee. Sonnen, on the other hand, will get another shot at Silva’s crown this Fourth of July weekend.